Use sketching techniques to draw thumbnails and hand in your thumbnails as scanned PDFs. Highlight three of the thumbnail ideas that you consider the best options and state why. Hand in an A4 with visuals of the three chosen thumbnails; include reasons for choosing each of these three options. Use sketching techniques and redraw ONE of your chosen concepts until you’ve reached a conclusion on a successful logo. Hand in your drawings as scanned PDFs. Experiment more with your favourite options from Step 3 and ask the opinion of a few people. Hand in examples of the logos shown to people and write their feedback or opinion on each. Choose your final design and execute it in Adobe Illustrator, along with the name of the product. Hand in your final logo as an A4 PDF. All of the sketches are gathered in one PDF file here. You can find a PDF with sketches here. I decided to call the dog food products “Happy”. Here are the three thumbnails which I chose. Bone – I find it strange that it does not appear in dog food logos. I think that it is a good idea, as bone is associated with dogs. Also it is a simple motive and we do know that a simple logo is a good logo. Nose and smile – a piece of a smiling dog, big nose and teeth shows a happy dog. A profile of a smiling dog. 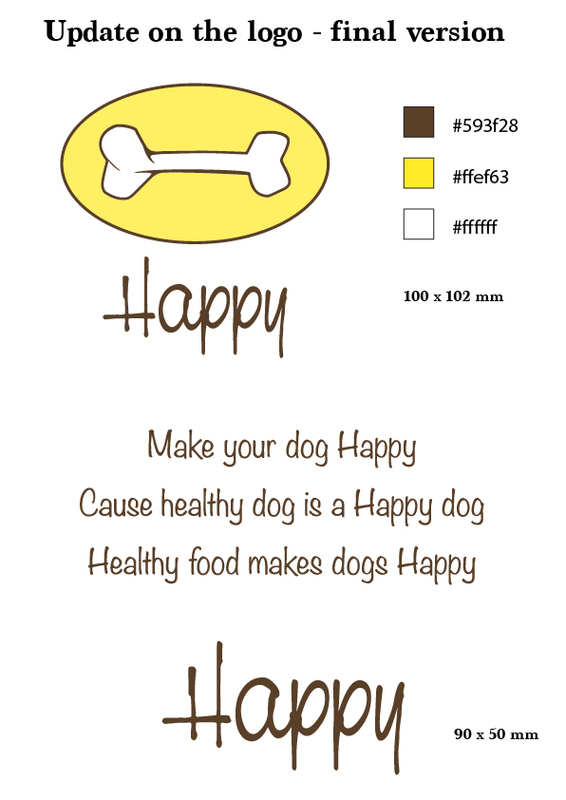 As the option 2 it shows a happy dog, this time it would be much simpler, just an outline. I decided to go with bright colors and simple motive.